Adolescent Depression: A Guide for Parents — Kelly Psychiatric Associates, Inc. In 2003, Adolescent Depression by Francis Mark Mondimore, MD changed the way parents and children view this condition and brought about a revolution in the field. In 2015, Patrick Kelly, MD, updated his co-author's edition with expertise only a Child and Adolescent Psychiatrist can provide. These doctors explain that serious depression in adolescents goes beyond "moodiness." Depression is in fact an illness—one that can be effectively treated. The authors describe the many forms of depression and the many symptoms of depression in young people—from sadness to irritability, self-harm, drug and alcohol abuse, and violent rages. What is the difference between depression and bipolar disorder, and which does my child have? How can I find the best mental health professional team for my child? What kinds of counseling and psychotherapy are available? Are medications safe, and how does a doctor choose a medication for my child? What can I do if my adolescent is using alcohol, crystal meth, marijuana, or other substances? How do autism and Asperger’s syndrome, eating disorders, premenstrual dysphoric disorder, ADHD, and disruptive mood dysregulation disorder interact with depression? What should I do if I sense that my child is in danger? With all of this going on, how can I take care of myself? "I heartily recommend this book to parents and relatives of adolescents who have or may have mood disorders. It... helps parents to understand the complexities of the problem [and] is optimistic of the likelihood of improvement with correct diagnosis and treatment." "An outstanding work that surpasses anything else I have read for parents on clinical depression and bipolar disorder in teenagers." "Clear, medically precise terminology, drawings, and diagrams." "This is an intelligent and well-written work with a substantial amount of detail especially about medications and how they work." "As I prepared this brief review, I found myself advising families to obtain their own copy of Dr. Mondimore's well-written, clear, and valuable book." "This well-written book is both comprehensive and scientifically rigorous. 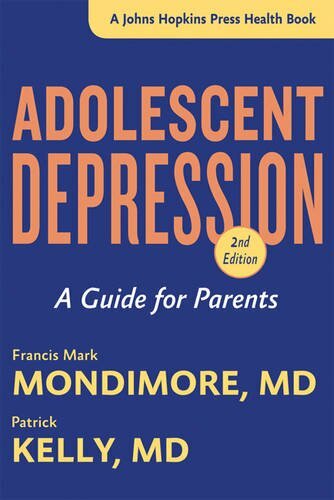 Dr. Mondimore makes the complex concepts and terms involved in the diagnosis and treatment of adolescent depression enormously accessible to the layperson." "Tired of all those guides for idiots and dummies? This book will provide some welcome relief... The author provides a solid reference tool for anyone who works with adolescents. It is highly recommended for education professionals as well as public libraries." "This is Dr. Mondimore's best book yet, thorough and comprehensive. He provides information that is vital for parents, pediatricians, and general practitioners trying to understand the behavioral symptoms of mood disorders in adolescents." "If you have a depressed teen in your household, this book is a must-read."